↑ আৰ. পি ফাইনমেন, আৰ. বি. লেইটন, এম. চেন্ডচ (১৯৬৩). The Feynman Lectures on Physics. ১. পৃষ্ঠা. ১-২. ISBN ০-২০১-০২১১৬-১. ↑ জে. চি. মেক্সৱেল (১৮৭৮). Matter and Motion. ডি. ভান ন’চট্ৰেণ্ড. পৃষ্ঠা. ৯. ISBN ০৪৮৬৬৬৮৯৫৯. http://books.google.com/?id=noRgWP0_UZ8C&printsec=titlepage&dq=matter+and+motion. ↑ এইচ. ডি.য়ং, আৰ. এ. ফ্ৰীডমেন (২০০৪). 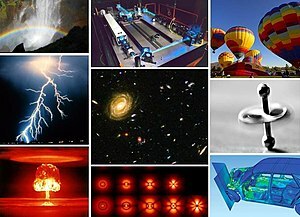 University Physics with Modern Physics (১১শ সম্পাদনা). এডিচন ৱিজলি. পৃষ্ঠা. ২. ↑ এচ. Holzner (2006). Physics for Dummies. জন ৱিলি এণ্ড চনচ. পৃষ্ঠা. 7. ISBN ০৪৭০১৮৪১৮. http://www.amazon.com/gp/reader/0764554336. ↑ টোকা: "বিশ্ব-ব্ৰহ্মাণ্ড" শব্দটোৱে ভৌতিকভাবে অস্তিত্ব থকা সকলো বস্তুকে বুজোৱা হয়, the entirety of space and time, all forms of matter, energy and momentum, and the physical laws and constants that govern them. However, the term 'universe' may also be used in slightly different contextual senses, denoting concepts such as the cosmos or the philosophical world. ↑ Evidence exists that the earliest civilizations dating back to beyond 3000 BCE, such as the Sumerians, Ancient Egyptians, and the Indus Valley Civilization, all had a predictive knowledge and a very basic understanding of the motions of the Sun, Moon, and stars.